Old Bay Seasoning is named after the Old Bay Line, a passenger ship line that plied the waters of the Chesapeake Bay from Baltimore to Norfolk, Virginia, in the early 1900s. In 1939, a German immigrant named Gustav Brunn started the Baltimore Spice Company (a company which still exists today but is better known as Fuchs North America and is located in Hampstead, MD). There in his new company on Market Place in 1940s Downtown Baltimore and having fled the Bavarian town of Bastheim, Germany in 1937 at the outset of the second World War with only a small spice grinder, Brunn created what would later become known to the world as Old Bay seasoning. He produced the “Delicious Brand Shrimp and Crab Seasoning”, as he first named it, to service the needs and tastes of the nearby seafood market. A catchier name was later suggested and Old Bay seasoning was born. For many years, the Baltimore Spice Company produced Old Bay until the legal rights to the seasoning brand were purchased by McCormick & Co in 1990 and the rights to the Baltimore Spice Company were purchased by the world’s largest privately owned spice company, the Fuchs Gruppe of Germany. 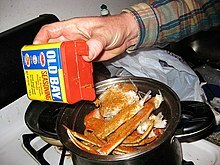 McCormick continued to offer Old Bay in the classic yellow can. According to Gustav Brunn, he had worked for McCormick for a week before starting his own spice business. The seasoning is chiefly used to season crab and shrimp. It is also used in various clam chowder and oyster stew recipes. The seasoning is also used as a topping on popcorn, salads, eggs, fried chicken, french fries, tater tots, corn on the cob, boiled peanuts, dips, chipped beef, baked potatoes, potato salad, and potato chips. Several movie theaters in the Chesapeake region offer it in the condiment section. Potato chip manufacturer Utz created the original “Crab Chip” based on a similar mix of spices. The popular potato chip variety was later copied and marketed by Herr’s (however, Herr’s uses Old Bay seasoning and it is sold as “Herr’s Old Bay Chips”). Lay’s introduced its own Old Bay-seasoned “Chesapeake Bay Crab Spice” flavored chips in 2018. Early in its history, the Subway sandwich shop used Old Bay when mixing their seafood and crab salad. Many local Subway shops still have Old Bay for use on sandwiches. Old Bay is also occasionally used around the Chesapeake Bay region as an ingredient in Bloody Marys, and even in places as far south as The Breakers Hotel in Palm Beach, Florida. In 2014, the Maryland-based brewery Flying Dog created an Old Bay-inspired summer ale named Dead Rise to celebrate the seasoning’s 75th anniversary. ^ Ingraham, Christopher (2014-05-07). “They put Old Bay on everything in Maryland. Soon you will, too”. The Washington Post. Retrieved 2016-03-08. 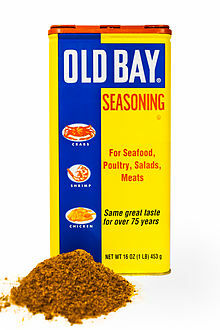 ^ “McCormick adds Old Bay products to its spice rack”. The Baltimore Sun. 1990-11-01. Retrieved 2011-06-06. ^ “McCormick buys locally invented Old Bay crab spice”. The Baltimore Sun. 1990-11-01. Retrieved 2013-01-11. ^ “Dead Rise – Flying Dog BreweryFlying Dog Brewery”. Flyingdogbrewery.com. 2014-06-20. Retrieved 2016-03-08.